En bild av det polariserade USA (Politico). Frank Luntz är en välkänd republikansk opinionsanalytiker som i många år har gjort intervjuer för att pejla stämningarna i folkdjupet. Metoden går ut på att samla en heterogen skara människor i s k fokusgrupper, vanligen ett 20-tal med olika partisympatier, och låta dem diskutera aktuella samhällsfrågor. Under senare år har Luntz kunnat notera att motsättningarna markant ökat mellan deltagare som är allt mer övertygade om sin egen ståndpunkt och allt mindre benägna att lyssna till andra. Eldfängd polemik har ersatt sansad debatt. Den djupa polariseringen är med andra ord långt ifrån bara ett elitfenomen utan något som i hög grad präglar det amerikanska samhället i stort. Frank Luntz intervjuades nyligen i CNN-programmet Amanpour (26/3) av Walter Isaacson, författare till stora biografier om bland andra Albert Einstein och Steve Jobs. I det följande återges delar av deras samtal, som finns i sin fulla längd här. 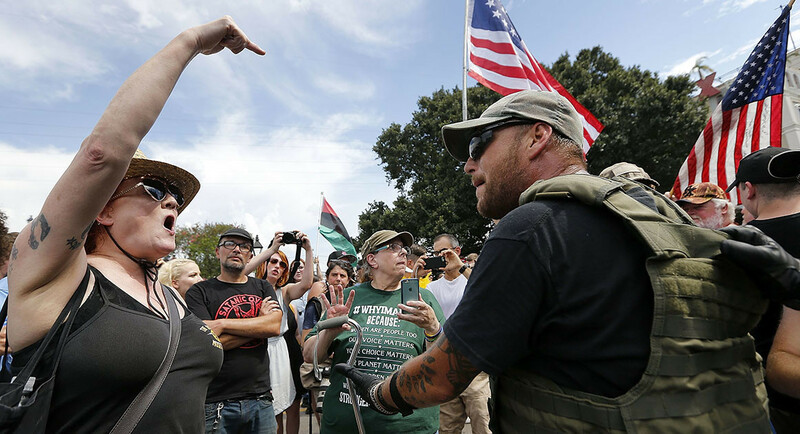 Walter Isaacson (WI): Why are we so polarized now? Frank Luntz (FL): It’s because we speak to be heard rather than speaking to learn or listening to learn. I think that for so many people for so long they had no voice, that the elites, people like you and me, we had a place where we could put out our information, television, newspapers, media, anywhere, but… the vast majority of Americans wanted to be heard, they were frustrated, they felt forgotten and left behind. And with the current political environment, they now have a chance to be heard. The problem is we’re not learning anything, we’re not growing… All we are doing is finding ways to demonize each other or worse… and we’re all doing it, on the right, on the left, in the media, in culture and entertainment. Any time you put a camera in front of you, watch the language that’s being used… it is so ugly and so polarizing. [N]ot only has it never been this bad, but the America that you knew and… celebrate in the great books that you wrote… that’s not the country we are right now. And it’s not… that we’re heading in that direction, Walter, I’m telling you, we’re here. If you heard what I hear, if you went to these sessions that I moderate and listen to people unedited, unfettered, it makes you want to cry. Här visas ett videoinslag med en grupp deltagare som ilsket far ut mot varandra. FL: [W]hen I was a kid I used to hear in Hebrew school sheket bevakashah which is basically, shut up and listen, don’t disrupt the class. You saw that. You saw the anger. And those aren’t kids. Those aren’t young adults. They’re people older than us… in their 70s. And if they behave that way, then don’t you think that people in their 40s are going to follow them, and people in their teens are going to follow those? My God. WI: But do you think that focus groups… have helped, and you have been in the lead of that, have helped polarize our society? FL: The purpose of the focus group is to bring attention to what people think and feel. It’s to give them a voice for three hours and then put them on television. FL: [T]hat whole group were first-generation immigrants from countries all across the globe. And they were the most hopeful and… optimistic. And… if they were here right now… they would tell you that America is still a great country. — And they would criticize all the meanness and bitterness that people have. But you only get that from an outsider. You don’t get that, if this is how you’ve grown up, you compare the way we are today to the way we were 20 or 30 years ago. So to finish your point, it’s a fair point. I thought that the purpose of these focus groups and sessions was to explain the anger… [and] the frustration. What it ended up doing, unfortunately, tragically, is feeding it… and I hate that. WI: What about the media and the filter bubble we have where we’re going to our corner of the blogosphere or our end of the talk radio dialer or a cable news channel? FL: [I]n the studies that I’ve done, I’ve realized this is really tragic that we now get our news to affirm us rather than to inform us. If you tell me you read The Wall Street Journal first, I’m going to assume that you’re on the right side of the spectrum. If you read The New York Times first, I’m going to assume you’re on the left side. And I’m going to be right 70 or 75 percent of the time. There are liberals who read The Journal. There are conservatives who read The Times. But we’re not crossing paths anymore. We’re not collecting the same information anymore. [V]ery few Republicans watch CNN. Very few Democrats watch Fox [News]. It shouldn’t be that way. And the more polarized our media, the more likely that the public itself becomes more polarized. WI: Do you think perhaps this polarized discourse is because the stakes are very high and there is a reason people are mad? FL: Look, we had this in, say 1848 to 1859 and we know what happened in this country and so many people died [in the Civil War]. We had the same thing globally in 1936 to 1939. The stakes are no less high now… And I know how it works out, because… I’ve read the end of the book [George Orwell’s 1984]. When you read the end of 1984, what has he done? He’s given up. That’s how he lived. — I don’t know any other way but to fight it and I’m so tired now. Come with me. Just come to these groups, listen to Americans, and it’s painful now. It really is. WI: But you know, we came through 1939. We came through 1968. — We came through the Civil War. FL: Your family – Bobby Kennedy did not. Martin Luther King did not. How many people were killed in 1968? It was the worst year of our time. And I think 2020 could be 1968 all over again. WI: … and righted itself. FL: Is Britain still the great power it was? Is France still the great power? — Russia had this most amazing empire that’s come and gone. How many empires… have come and gone? And I really don’t want to be around to see the end of mine. WI: You talk about some of the really tough times. And one of the things that happened in each time was the emergence of a new movement. Sometimes a new party. — Do you think there can be a realignment or even a third party in American politics that says we’re about to go off a cliff, let’s get sensible? Luntz nämner flera självständiga politiker som haft modet att ibland avvika från partilinjen (demokraterna Howard Schultz, Michael Bennet och Mitch Landrieu samt republikanerna Tim Scott och Ben Sasse). FL: There are amazing people out there. But I think the system will break all of them. 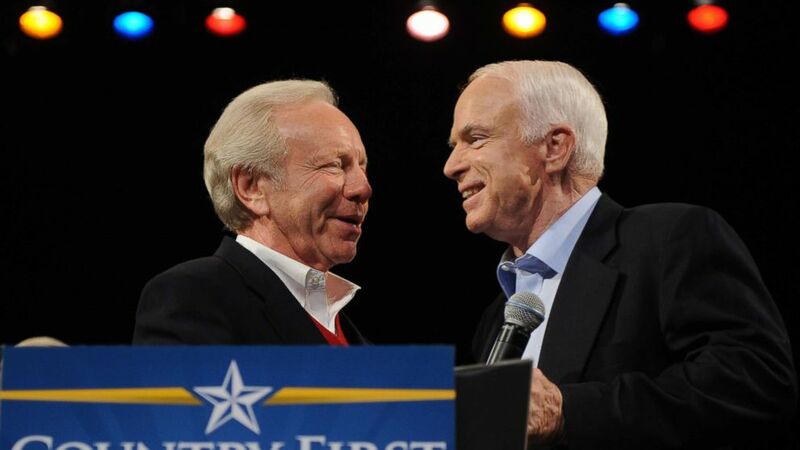 En aldrig förverkligad ”dream ticket” (Joe Lieberman & John McCain, ABC News). WI: But… suppose you had a pragmatic Democrat, one who said, I’m going to try to work to get things done… How would you have them run? Could they possibly win? FL: We actually had one. His name is John McCain and he wanted to choose Joe Lieberman [for VP candidate]. What an amazing thing that would have been… And you know what happened… McCain was destroyed. They told him it will block your nomination if you do this. But [we’re] even more partisan today. WI: You’ve been so pessimistic. First of all, why don’t you then just walk away from it all? Or secondly, could you find a new purpose in how you could direct your political talent to do something different? FL: I have a purpose and it’s the next generation. I’m teaching at NYU Abu Dhabi…, the most global campus on the face of the earth. I’m taking 17 students on a ten-day trip to London, Paris, and Brussels at the exact moment of Brexit. Last year, I took them to San Francisco, Los Angeles, Washington, and New York and introduced them to conflicts in America. [T]he reason why I do keep going is because… every day they solve problems. Every day they address conflicts. The Russian student’s best friend is Ukrainian, and they’re roommates. You have Jewish students who have close relationships with Palestinians and other Arabs. You have Chinese students who are close… friends with countries that they have invaded in my lifetime. That’s the solution. Our only hope… is that we teach children to love, not hate. — If we can wring out this hate in that generation, this world survives and America prospers. Det är utomordentligt talande att Frank Luntz, som talat politik med fler amerikaner än de flesta, i dag får gå till ”the outsiders”, människor med invandrarbakgrund och utländska studenter vid NYU Abu Dhabi, för att finna något hopp om framtiden.